Every post has helpful links, so please check them out if you’re thinking of having a Minecraft party. 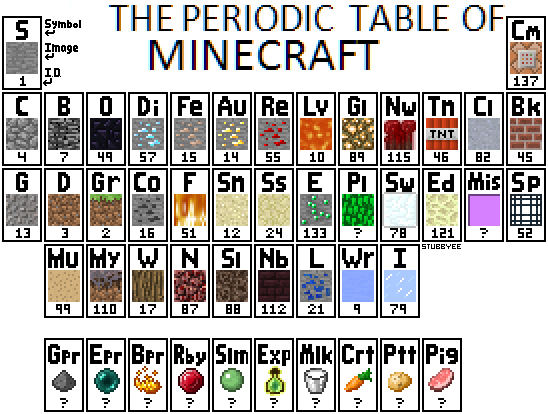 For Part 4, we’ll go over foods you can match with the Minecraft Periodic Table, and drinks. There are many sources for free printing labels and decor: Minecraft Forum, Box, Family Shopping Bag, and the list can go on. Other foods not seen in images: pretzel sticks for torches, the sheet pizza (conveniently comes cut into squares), crispy wings which were made in-house were labeled chicken, the cake (which will be in next/last installment) was a Creeper. Other good choices would be to make coal from Oreo Krispy Treats, shaped into rocks and making your own rock candy in various colors to match the elements. Each item we chose carefully for their characteristics. In other words, we chose water for the healing potion because it is the best thing a human can drink. For the soda, since it was caffeinated, people normally get a lift – so it was the Potion of Strength, and so on. We covered juice boxes only on the front/sides with Creeper faces so guests could easily choose their favorite flavor. You’ll find a list of potions and images at Gamepedia. For Cookie Creepers you’ll need a washed plastic ruler, a sheet of paper, a sharp knife, and a sheet of black fondant. You’ll also need a basic sugar cookie frosting (one that hardens quickly) recipe. Cut out eyes, nose, and mouth with a piece of paper and place your template on a cookie to see if they are correctly sized for the cookie. Then take that measurement used on the paper and cut the sheet fondant to those specs. Add a dab of frosting to the areas where the fondant will be placed, stick on the squares of fondant. *These cookies were probably one of the most time-consuming efforts but we were glad we did it. For Cookie Blocks: Melt a few squares of chocolate bark with 6 oz. of semisweet chocolate chips. *If not accustomed to melting chocolate please follow directions on Wiki. Once melted, dip a fork into the chocolate and spread at the bottom of the square cookie. Drag the fork over the middle chocolate edge to give the appearance of grass. Smooth over the chocolate with the fork bottom if the chocolate needs to be better distributed. Crispy and Green Chocolate Bricks: We followed a Rice Krispie Treat recipe and replaced the rice cereal with Cocoa Krispies. We then added a layer of green melted chocolate to the top of the entire sheet of treats. Once the chocolate hardened, we used a sharp serrated knife to cut the blocks. I’ll try to wrap up the next segment with the cake/directions and other miscellaneous info that could be used for having an awesome Minecraft party. This entry was posted in Party Ideas, Recipes and tagged decorations, DIY, girls, Minecraft party ideas, printables, Recipes, templates by thewritegirlforthejob. Bookmark the permalink.